A very close friend of mine makes the most delicious fish recipe every Friday night, for Shabbat dinner. Her family has prepared this Moroccan Fish for many years, and she too has picked up the skill of preparing such deliciousness. Both my husband and I have always enjoyed this dish when she has invited us for dinner, but after seeing my almost 4 year old, who is a very picky eater, gobble up his serving of fish and then ask for more, I was determined to give this Moroccan Fish Recipe a try myself. So after a phone call with my lovely friend, Gali, who gave me a very detailed explanation of how to prepare this fish recipe, I got to work. This popular Middle Eastern dish is actually very healthy, and pretty low calorie. I made a few minor adjustments to make this more of a Weight Watchers Recipe, but overall, it’s a very diet friendly dish. The family LOVED it. This is definitely going into my regular rotation! It’s so easy to make and it’s such an incredibly flavorful recipe. Just note that her original recipe actually uses real tomatoes, not canned, but I didn’t have enough fresh tomatoes on hand, so I used the canned, and it still turned out incredible. If you want to use fresh tomatoes instead, it will take a lot longer, as the tomatoes will need to cook down to a sauce-like texture. Additionally, you made need less broth. Either way, this Moroccan Fish Recipe is amazing, and I highly recommend giving it a try! 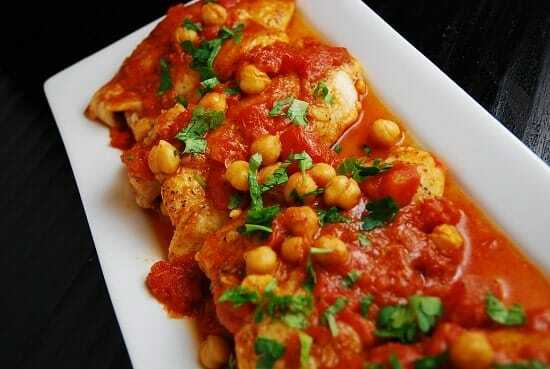 This traditional Moroccan Fish Recipe is often served at Shabbat dinner. It’s delicious, flavorful, and very low in fat and calories. Truly a delicious and easy Weight Watchers dinner recipe. Heat oil in a large, non-stick skillet on medium high heat. Add in the garlic, and cook until slightly tender and fragrant, about 2-3 minutes. Stir in the diced tomatoes, tomato paste, chicken bouillon, chicken broth, cumin, onion powder, paprika, coriander, and salt and pepper. Bring to a simmer and then reduce heat to medium, stirring occasionally. Add in garbanzo beans and let cook for about 45 minutes, adding more broth as necessary if sauce becomes too thick. Taste and add additional spices and seasonings if necessary. Season both sides of fish fillets with additional salt, pepper and paprika, and then lightly mist with an olive oil mister. Place fish into pan with the tomato sauce, and gently cover each fillet with some of the sauce. Cover pan, and cook for about 15-20 minutes or until fish is cooked through and flakes easily with a fork, making sure to keep spooning sauce over the fish fillets while cooking. Garnish with optional parsley or cilantro and serve immediately. I do think it would be better if you can simply edit the recipe to say “water” or “vegetable broth” or “pareve instant soup mix” in place of the words “chicken broth” as of course, that would deem the recipe no longer kosher if it were actual chicken broth used! According to kosher dietary laws we do not eat fish together with chicken or meat. I was surprised to see chicken stock in a fish recipe meant for Shabbat dinner and tagged kosher. Maybe I can substitute water . . . Or vegetable broth. Definitely NOT kosher with the chicken broth and bullion. My MIL never makes it with broth and she’s Moroccan. She actually uses a considerable amount of olive oil and cooks down the liquid before adding the fish. Since I’ve started making it for Shabbat, I’ve cut out much of the oil to about a tablespoon and incorporated vegetable broth for more “sauce” so I could dip my challah in. I’m used to having it spicy too. Not sure if that was how hubby’s mom preferred it but I love tossing in long green peppers in whole. YUM! I use purchased stock or home made always parve. However, I have kept kosher my whole life and fish is considered parve. If you have kept kosher all you life, then you should know that fish & meat or chicken are NEVER cooked together or served on the same plate or at the same time. Fish is considered pavers, however I suggest that you consult an orthodox Rav so he can give you a proper explanation & hopefully clear up your mis-conception. I was going to say the same thing, it’s not kosher to combine chicken broth with fish! If you use veg broth it will be kosher. It’s not “self-righteous, Sylvia, to state a fact in the hope that others don’t make this mistake. Any observant Jew will tell you that it’s not kosher to do this. Keeping kosher maintains a beautiful connection with G-D through the clear directives He gave us in the Torah. Almost all “chicken flavored” powered bullion is Parve not fleish. (not meat) I’m surprised that kosher consumers find this a issue or are argumentative about this, if you are not aware, Parve bullion is absolutately kosher to use! It is not about the bullion powder, Mushla, it’s the CHICKEN BROTH called for in this recipe that is causing people to speak out, because if it were actual chicken broth, it would deem the recipe not kosher. Fish and meat are never mixed. It would be so much easier to simply list vegetable broth or pareve soup or water as the ingredient instead. For anyone who cares, there are actually real Jews who consider it fine to eat meat and fish together. You’ll notice I mentioned real Jews, because I’m going to guess the replies will be all about how they’re probably not Orthodox, yada yada. If anyone has a question, they should consult their own rabbi – you don’t have to just accept the opinion of one train of thought to be Jewish. There are many streams. I just discovered your site. I can’t believe I didn’t know about this before! Cannot wait to try your recipes. Definitely seem more flavorful than other ww recipe sites! i like food spicy so i added extra pepper and i added crushed red pepper….while the fish was poaching in the sauce i also covered the entire thing with broccoli and sliced mushrooms and let that steam while the fish poached. very very tasty !!! will make again and again and again thank you. The garbanzo beans are not critical. You can use a vegetable if you like…like zucchini, instead. Another interesting recipe. I liked this. It was a really nice change of pace. I can’t fully comment because I failed and forgot my shopping list. So mine had fresh tomatoes, onions instead of onion powder and sole instead of tilapia. Also no chicken bouillion. The sole fell apart, so mine became a stew. Whatever, it was tasty and true enough to the original recipe. I would be interested to try it as written though. If we don’t have an olive oil mister, do we leave that step out or is there another way of doing it? Question–did you really mean a 28 oz. can of tomato paste? Or did you mean a 28 oz. can of diced tomatoes? The ingredients list says the former, but the instructions refer to the latter. Thanks!